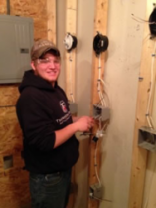 First year students start with safety basics and tools of the trade designed to give students entry-level skills.They use mock-ups to experience the typical wiring of today’s modern home. Understanding blueprints and schematics. All wiring meets or exceeds National Electrical Code standards.